Every time the economy goes through a period of crisis, Keynes’ name is called upon by economists and politicians from diverse backgrounds. However, 70 years after the publication of The General Theory of Employment, Interest and Money, specialists are still far—maybe everyday further—from reaching agreement about the genuine contents of Keynes’ most important work. This controversy has been marked by a paradoxical turn: it is above all the literature about Keynes which, in the last decades, has imposed the terms of the debate, while The General Theory lacks readers. Accused by both its detractors and admirers of being a confusing book that is inconsistent and even plagued with logical errors, the most important contribution of the most influential economist of the 20th century has been condemned to be forgotten or, at best, to live uncomfortably in the voices of those who have spoken on his behalf. This book is the result of rigorous critical research which reconstructs the spectrum of discussion surrounding Keynes’ main work. The book begins by describing the historical background and the state of the pre-Keynesian economic theory, subsequently immersing the reader in a concise but detailed—as well as innovative— interpretation of the original text. The revision of some of the main interpretative currents prepares the field for the book’s ultimate contribution: the identification of the fundamentals that sustain the analytical structure of The General Theory. 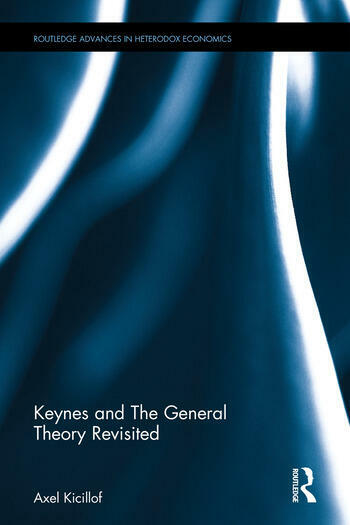 At the same time, this exploration of the theoretical fundamentals of The General Theory makes this book an original intervention on the genesis and relevance of the divide between micro and macroeconomics—a division that has been fully accepted by contemporary macro theorists. What Did Keynes Call Classical Theory? Axel Kicillof (Buenos Aires, 1971) has a PhD in Economics from University of Buenos Aires. He has been a researcher at CONICET (Argentina's National Scientific and Technical Research Council) and at the Economic Research Institute (UBA), as well as Professor at several universities in Argentina. He is a specialist in History of Economic Thought and Macroeconomics. He is the author of "Fundamentos de la Teoría General", "Economía sin Corbata" y "De Smith a Keynes" ("Fundamentals of the General Theory", "Economy without a Tie" and "From Smith to Keynes". He has held the office of Minister of Economy of the Argentine Republic. He is currently a member of Argentina's national parliament, representing the City of Buenos Aires in the Chamber of Deputies.